Maybe this isn’t the video of Donald Trump driving around his son and wife at night while listening to Taylor Swift’s “Blank Space” we want, but it’s the video of Trump driving them around while listening to “Blank Space” we need. Or perhaps this short clip of the now-first family, captured by Melania from the backseat of the Trump Rolls-Royce back in December 2014, is the perfect video for Trump’s America of how we live now. 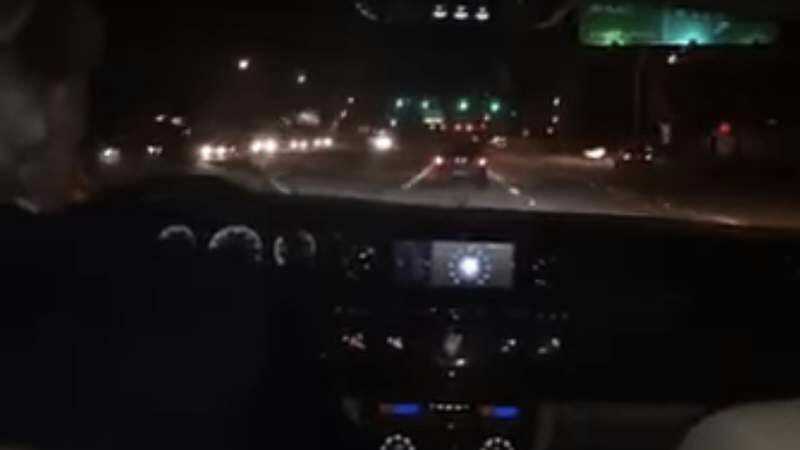 Almost certainly, this 19-second snippet of a bygone era, one wherein Melania Trump could post to her Facebook page a video of her husband driving at night while their son Barron sits in the passenger seat, is the ideal metaphor for the current governmental crisis and roiling cultural tempest in which we now find ourselves in the United States. Just give us another few minutes, we’ll nail this—these think pieces don’t just write themselves, you know. Certainly, when Billboard found this old clip of the soon-to-be President Of The United States, a formerly lighthearted video now festooned upon the collective past of the country, an albatross conjoined to America as our country sits, eyes glazed over in the headlights of the national disaster currently unfolding all around us, the site stumbled onto an analogy par excellence. Indeed, who would dare not use this somehow tranquil, almost zen-like clip, posted with the affectionate tag “Fun night with my two boys DJT & BWT” and a heart emoji for punctuation, as an incisive tool to peel back the layers of social media dross, exposing the tachycardia laying waste to the heart of the grand democratic experiment? What, should we just point out that it’s somehow hilarious and relaxing all at once, and leave it at that? That doesn’t exactly net us a spot in the next issue of Utne Reader, now, does it. Swift’s lyrics, wondering “if the high was worth the pain,” surely speak to the aftereffects of the 2016 election, in which the pyrrhic victory of nihilistic trolling performed on a national—nay, global—scale resulted in the coming to power of an administration with an avowed intent to roll back the progressive advances of the 20th century. The nighttime setting, in which Trump traverses the landscape, his family silently positioned alongside and behind him, calls forth the manner in which the president’s unacknowledged class warfare rolls over the concerns of working people like a Panzer, his eyes no longer able to see the true state of the socioeconomic world wrought by decades of anti-government zealotry and corporatist corruption. Right? Something like that? That sounds good. And if you actually watch it on the first lady’s Facebook page, where the video will autoplay ceaselessly on into the ether, repeating endlessly the reminder that this will “leave you breathless—or with a nasty scar,” it testifies to the division ripping this country in twain, the hyperpartisan divide in which those on the right and left live not only in different ideological bubbles, but different conceptions of reality altogether, wherein we can view one and the same state of affairs as either a thrilling twist or a catastrophe of Biblical proportions. Failing that, it is weirdly pleasant, isn’t it? Like a lava lamp. But mostly the political pedantry masquerading as penetrating insight, for sure.